Hi loves! How's your week going? It's been sleepless over here. Poor Hunter is teething so no one has been getting any sleep. Fingers crossed they pop through soon so we can get more shut eye. Onto the post! 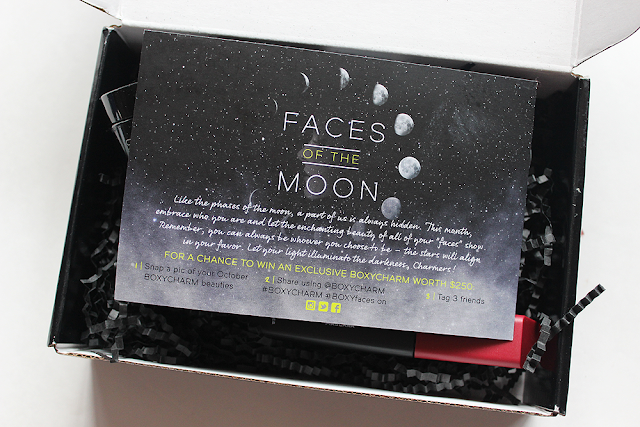 I have a review of the BoxyCharm October box! What's BoxyCharm, you ask? BoxyCharm is a beauty subscription that comes to your doorstep every month with 4-5 full size luxury items for $21 a month. 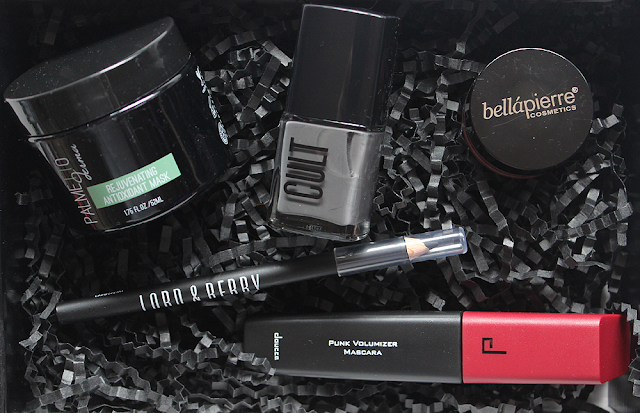 While that might sound a little more expensive than other subscription services, consider that you're getting guaranteed four full size products every month while compared to Ipsy where it's only $10 but they're usually smaller samples. The promise of full sized products alone totally got me hooked on it! 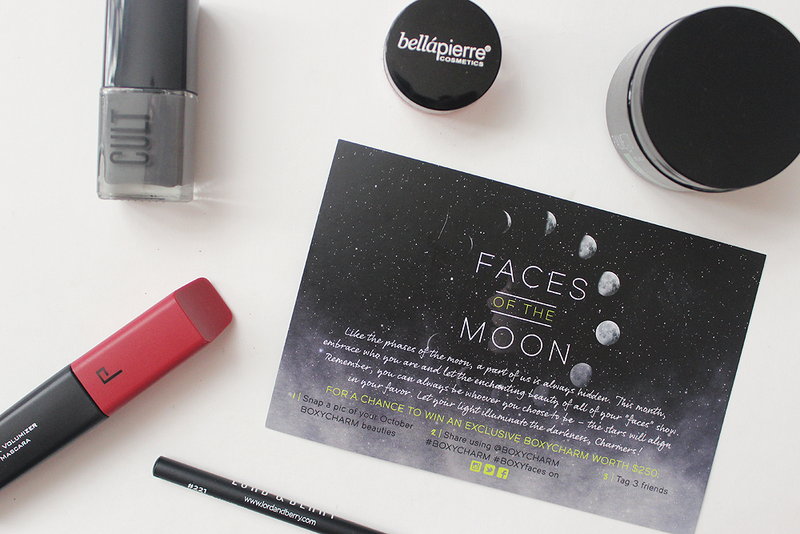 October's theme was Faces of the Moon which is a pretty unique theme, am I right? This box is all about embracing who you are but also letting the beauty of "all your faces" show. Love that! Palmetto Derma Rejuvenating Antioxidant Mask ($64) - Let's start with the most luxe product in the box! At $64, this mask is about three times the box itself so you're already getting your money's worth with this product alone. This clay mask gently purifies by cleaning your pores and skin. I love that they put a universal mask in the box. Sometimes you can receive skincare and it's not for your skin type so it's kind of a waste. This mask, however, can be used on all skin types. Bellapierre Cheek and Lip Stain ($20) - This stain is great for people on-the-go as it combines two products into one. You can apply the lip stain as you would a lip balm or dot it on your cheekbones and blend in for a nice, flushed look. I like that this stain is very natural looking. I've had ones where I've gone to dot it on my cheeks and there's been bright red dots that would not blend. Lord & Berry Line Shade Eyeliner ($18) - I love trying out new brands! This eyeliner is formulated with kajal and kohl to provide deep, rich color. I like that you have time to smoke it out before it becomes unbudgeable. It's really long-lasting and doesn't flake away. Cult Cosmetics Nail Polish in Boneyards ($12) - Currently rocking this on my nails right now! Boneyards is a smokey grey polish that screams fall to me! Consistency is nice and was opaque with two coats. Cult Cosmetics is also a new brand to me. I honestly got them confused with Cult Nails at first and then did some research to find that they're two different companies. Doucce Punk Volumizer Mascara ($24) - This mascara is not your typical mascara. First off, mascara packaging itself is kind of clunky but for a good reason: that's to house the plump mascara wand inside! The consistency of the mascara wasn't too thick or wet and really lifted my lashes while elongating them. I was surprised! Overall: This box had a lot of products and brands I had never heard of which I loved. I'd have to say my favorite product from this box would hands down be the Cult Cosmetics nail polish. I'm drooling over the color! What's your favorite product from this box?